At Visteon, we hire experienced professionals across the globe for all types of positions in engineering and other fields. Naturally, the qualifications and skills we seek vary considerably among regions and job categories, but some practices apply to our hiring processes for positions at any Visteon location. In the application, interview and follow-up stages for every job opening, certain factors guide us in our selections. We’ll explore those areas in this series of blog posts to help you, as a candidate, ensure that you are at your best during interactions with Visteon. DIFFERENTIATE YOURSELF– Using a template from Word or other boilerplate designs doesn’t add value. Your resume should be creative, but also succinct and easy to read. Place a summary at the top, and use a bulleted format. You have about 15 seconds to convince the recruiter to read further. MAKE IT RELEVANT – In some locations, we use software to identify keywords in resumes based on the descriptions of jobs for which candidates are applying. For technology roles, those keywords might relate to specific software, platforms or systems experience critical to the position. I recommend candidates thoroughly review the job description, and align your interest and experience accordingly, since managers are looking for specific information and put considerable effort into matching the right people with open positions. Focus your time and effort applying for jobs for which you’re qualified. KEEP YOUR PROFILE CURRENT – LinkedIn is the primary online resource we use to find people who may not directly apply but who may be ideal for an open position. We match profiles from LinkedIn with our job descriptions and frequently discover highly qualified candidates. Be sure your profile is current and includes newly acquired skills and new technologies that you’ve mastered. Be aware that no Visteon recruiter will ever ask you for personal information, such as your social security number or financial information, nor require you to purchase your own equipment for employment. BE ACCURATE – Our managers have immediately rejected candidates whose resumes contained spelling errors. If you can’t take the time to ensure your resume is accurate, chances are errors would show up in your work as well. Also, don’t inflate your experience. If you stretch the truth, it will become evident during the interview stage—or worse, after you’re hired. Instead, present some good examples of your experience; for technology roles, state when and where you have used particular technologies. SHOW INTEREST – Visteon’s social media channels provide insight into what the company does and our corporate culture. It may help your chances if we are aware of you through posts or comments on Visteon’s social sites, but be thoughtful in your commentary. We pay special attention to those who follow a lot of Visteon employees and Visteon as a company. We want candidates who are interested in us. TAKE INITIATIVE – If you’re truly interested in Visteon, join our Talent Networkand sign up for alerts so you’ll be notified as soon as a position becomes available. We try to fill open jobs within 90 days; the sooner you apply, the more quickly you’re placed in the candidate pool. Above all, learn who we are and what we do before you begin the application process. The most important thing you can do when applying is to be honest. This applies to your resume and the job interview. You’re best served by representing yourself as exactly who you are, and we’ll do the same. We want our relationship with you to be a great long-term partnership. 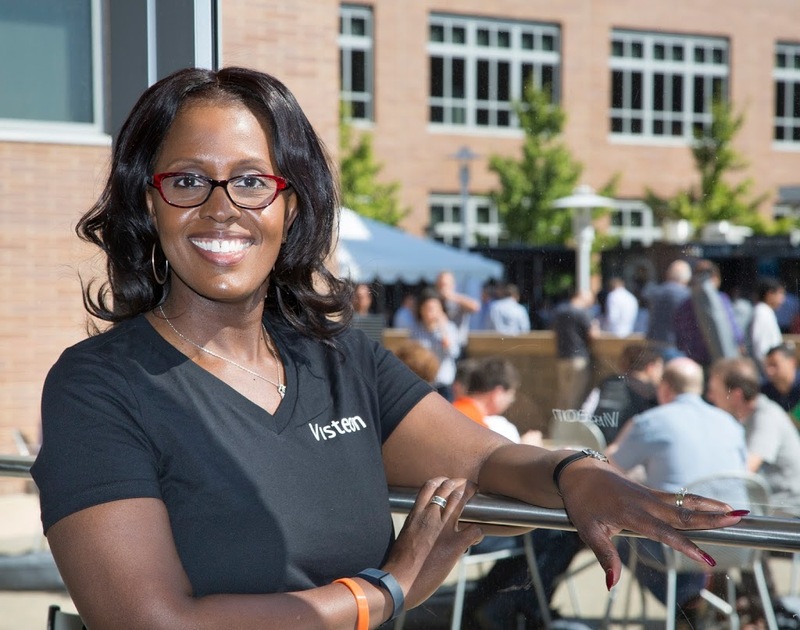 As global strategic staffing associate director, Kenya Bulluck brings 18 years of human resources experience to lead recruiting at Visteon. During her career, Kenya has been on the forefront of utilizing new technology and platforms that have revolutionized the recruiting and hiring process for professionals, college graduates and interns. Kenya received an MBA in Human Resources from Michigan State University and is an active member of the Society for Human Resource Management and the American Society of Employers. Peek down the aisle of your favorite electronics store today and your eyes are likely to pop. Your HDTV that was a leading-edge entertainment center just a year or two ago already is tumbling over the edge of obsolescence. Today the banner of innovation flies over 65-inch 4K Ultra HD smart TVs, with four times the pixel count of HD. Moreover, the same TV set also supports 3-D image – along with a Web browser, apps and a voice-activated remote. In the next aisle, you’re likely to discover new virtual-reality devices for mobile phones that immerse consumers in video environments. Now, sit in your car and compare those with your vehicle displays. Even if your car uses colorful digital graphics, most displays show a flat, two-dimensional image. Take heart. 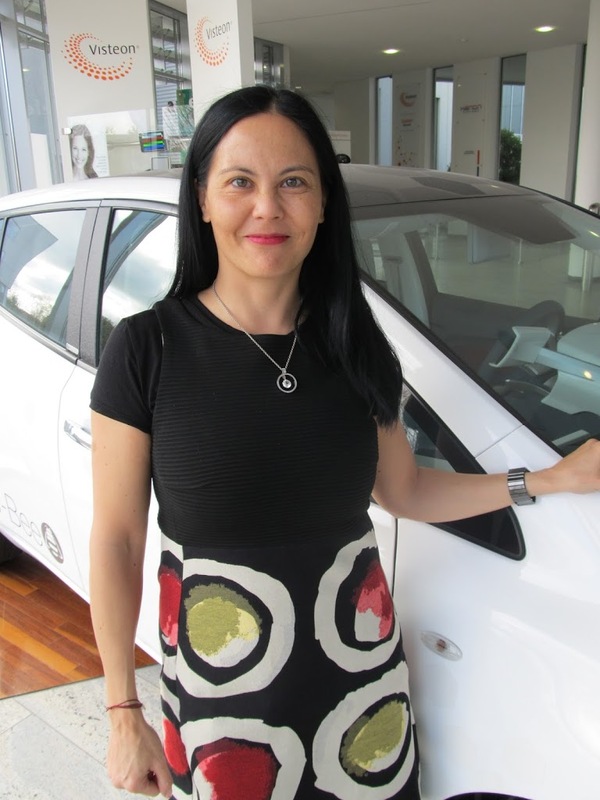 The auto industry is working hard to adopt the trends erupting in consumer electronics. Some automakers are designing displays to look more like consumer tablets, no longer embedding them in the instrument panel. For both driver information and infotainment, they are moving away from traditional layered menu systems to more of a flat consumer style interfaces with icons or tabs. However, making the instrument cluster more interesting and customizable has been more challenging. The instrument cluster needs to convey information at a glance so designers have held onto 2-D and mechanical gauges to which drivers are accustomed. Yet, updated approaches soon will change even the venerable speedometer and fuel gauge. A traditional cluster incorporates two large mechanical gauges with moving pointers, separated by a small to medium size display that renders 2-D images. However, many vehicle manufacturers are asking for enhanced graphical image quality with increased resolution. This is perceived to provide better quality, as users now expect the same image quality as high-end consumer devices. With the advent of even more advanced driver assistance systems, automotive manufacturers need to provide more information to the driver, which necessitates larger displays. This has resulted in the adoption of fully reconfigurable instrument clusters where traditional mechanical gauges, small displays and warning telltales are replaced by one larger TFT display – typically 12.3 inches. Some carmakers have started presenting the graphics using 3-D rendering, however most have tried to replicate a traditional mechanical gauge look and feel. The challenge with 3-D rendering is that that objects assume more of a 3-D appearance when they are moving around the screen, because the shadows, reflection and lighting on the object is changing; the eye is tricked into thinking it is a solid object. Traditional gauges and most instrument cluster images are stationary, so it is difficult to make those objects look truly three-dimensional in a 2-D display. 3-D displays have been available for some time and have been used in the consumer industry, but have not been adopted in the automotive industry due to a number of constraints with the technology such as eye strain, limited or restricted angle viewing and potential nausea. Some even require glasses which would be unacceptable for an automotive application. A new multi-layer display technology has been developed that allows stationary objects to appear three dimensional and solid. This multi-layer cluster uses the same thin-film-transistor (TFT) screen technology used in TVs, smartphones and cars but has two panels—with one screen placed in front of the other. A proprietary graphics rendering plug-in partitions shading and color between the two layers to make the objects appear solid and three-dimensional. The dial of the gauge may be on the background TFT, while the pointer and rim are depicted on the front screen, producing the 3-D effect. The current resolution of this multi-layer cluster is 1280 x 480 per screen, and within two years it will likely increase to 1920 x 720. This technology not only provides solid 3-D looking objects, but has the benefit of being totally reconfigurable so the graphics and layout can be completely changed at the touch of a button. The cluster can be customized by the automaker for different vehicle models and brands, and potentially by the driver to match his or her preferences. This 3-D cluster is only the beginning of automotive three-dimensional graphics design. As autonomous vehicles begin cruising the highways in future years, the cluster will likely become more immersive – showing buildings, landscapes and obstacles surrounding the vehicle. When steering wheels are not needed, the cluster screen can display 3-D movies, games or video calls. When you drive away from the electronics store, be kind to your old-school in-vehicle electronics; it’s on its way out, too. 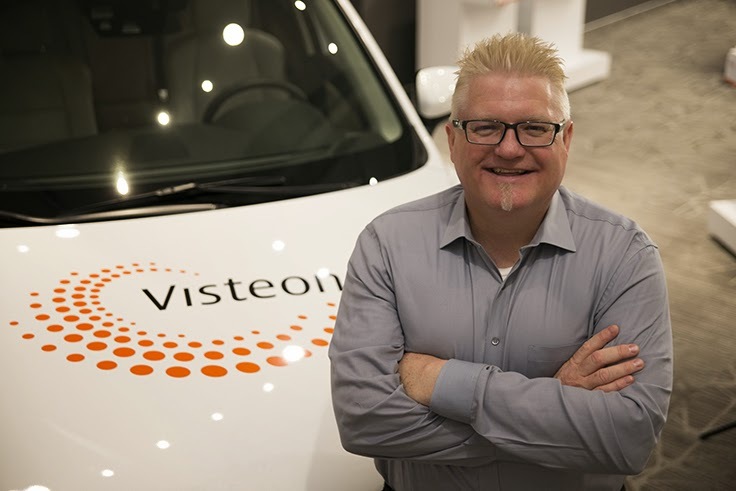 Chris Round is a technical sales manager at Visteon. He has 26 years of experience in the automotive electronics field and has bachelor’s and master’s degrees in engineering. He is responsible for developing instrument cluster and HUD design proposals for Visteon’s customers as well as presenting new product technology. Chris is an active member of the SAE and enjoys motorsports as well as mountain and road biking. There was a time – albeit brief – when businesses and consumers thought the Internet was just a fad. The same attitude existed regarding social media in its early days. When the iPad was introduced, many people just scratched their heads over why they needed one. Today, no one doubts the importance and potential impact of the latest tech revolution – IoT (Internet of Things). For the first time, developers and consumers are tying together not just virtual worlds but also real, physical things – allowing these objects to communicate and interact with each other. The Internet of Things is making new connections inside cars and trucks – which is where Visteon innovations surrounding smartphone apps can be found. Today’s infotainment systems can replicate your smartphone’s content onto displays inside your vehicle. What they have not been able to do is combine information from your phone with data from your vehicle to make driving smarter and to provide real-time feedback based on where and how the car is operating. Now that’s all changing. Visteon’s latest innovation allows automakers to offer their own specific apps that take advantage of vehicle data. Utilizing a new cloud-based app framework, jointly developed with OpenCar, Smartphone app developers can easily migrate their existing apps into OEM-specific vehicles, and take advantage of the wealth of data available to the typical connected infotainment system. To illustrate the added capability that this type of connection can offer, Visteon worked with Chamberlain to integrate and enhance its MyQ™ smartphone app into a production Infotainment system. MyQ™ currently allows drivers who are away from their homes to determine if the garage door was left open and, if so, to close it remotely. Visteon has developed an app that can combine data from the garage door and vehicle, as well as OEM-specific graphics and HMI, resulting in the vehicle-integrated MyQ™ Garage app. The MyQ™ Garage app has vehicle-unique features, such as Park Assist. This feature allows a driver to perfectly position a car in the garage, forgoing the old fashioned tennis ball strung from the rafters. As the car enters the garage, the front tires cross the opener’s floor-level safety beam. Vehicle wheel sensors count the revolutions and relay data to the app showing a real-time graphic on the central display, simulating the car’s position and where to stop. As the system is used, it learns the preferred parking location. Another example of this technology’s usefulness involves geo-fencing. Within an owner’s Web portal, a driver creates a virtual fence around his or her home. As the vehicle passes this virtual fence, the vehicle navigation system is triggered to check if the garage door is open. If it is, a message is automatically shown on the car’s display, asking if the driver wants to close the door. Such detailed real-time feedback is not possible with standard smartphone apps, or their in-vehicle screen replication counterparts, such as Apple CarPlay, Android Auto or MirrorLink. While these are all proven ecosystems, that are an everyday convenience for most smartphone users—they do not offer the consumer the complete set of capabilities. Visteon is committed to giving automakers and consumers the content and features they desire in their vehicles. OEM-specific app stores can co-exist with the current Tech Giants, providing connected apps that inject the hidden intelligence within the vehicle into apps for a new level of smart driving. Brian Brackenbury is a senior manager in the Technology Office, leading new business pursuits for infotainment, connectivity and telematics. 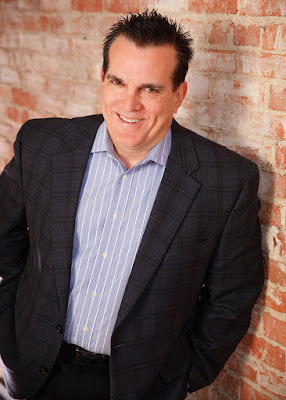 Prior to his current role, Brian led the global engineering activity to launch the MazdaConnect infotainment system, as well as leading core platform development for the connectivity domain. He received his BSEE from Michigan State University and his MSEE degree from the University of Michigan. Understanding consumer trends is an often overlooked, yet very critical, consideration for automakers and suppliers during the product development stage. Awareness of trends is essential to delivering products that meet the unknown but anticipated demands of existing and future consumers. To fully grasp what future consumers may want, an analysis of change processes and trends (inside and outside the auto industry) is required. To predict the shape of the world for years to come, researchers consider the view through the lens of social, technological, economic, environmental and political grounds (“STEEP”). This allows them to anticipate what consumers will want before those desires reveal themselves. The purpose of advanced trend analysis is to take advantage of what’s occurring in this fast-moving world and to capitalize on it — or at least avoid being caught unaware by it – thus adopting a mindset to better prepare for the future. Such analysis incorporates various tools that can interpret signals and visualize possible scenarios – always with the caveat that no tool can guarantee to predict the future accurately. Digitalization – This has spawned the creation of traffic data universes to manage mobility. Systems assess participants, locations, speeds and mediums used. Localization, detection and real-time processing have transformed traffic into a spontaneous self-controlling system. Technology – This has created an increased awareness about alternative transport options never available before. This includes varying drivetrains (e.g. electric or fuel-cell vehicles) as well as the wider use of a variety of mobility services (e.g. ride sharing and Uber) that are transport medium neutral without being fixed to specific modes of mobility. Before, during and after transit, users receive real-time recommendations how to most efficiently reach their destinations. As a result, lifestyles become more sustainable – and we know from research that consumers do not want to be less mobile, but more intelligently mobile. In the near future transportation options will be more attractive, because of technology and the variety of mobility services it offers. Consequential outcomes are new business models such as the transformation of the auto industry from a vehicle manufacturer to a mobility services provider. The car no longer is an isolated function as it serves several purposes. Vehicles will be permanently online – sending and receiving data. Connectivity allows the implementation of new features – such as display styles, interactions and user recognition (personalization) – so the ever-more important rich user experience becomes possible. Upgradeability is another current industry challenge driven by customer expectations – which in turn is defined by the constant stream of upgrades typical of the digital ecosystem (smartphones, for instance). Architectures and platforms are required to perform these updates, upgrades and enhancements. This explains the changing landscape of the auto industry, with collaborations springing up that involve non-traditional suppliers from other industries. Gaining an early awareness of trends, and applying that insight in the product development process is necessary to meet constantly changing market and consumer demands. This understanding of future consumer desires – and the dynamics of the automotive market– is a key driver to remaining competitive. 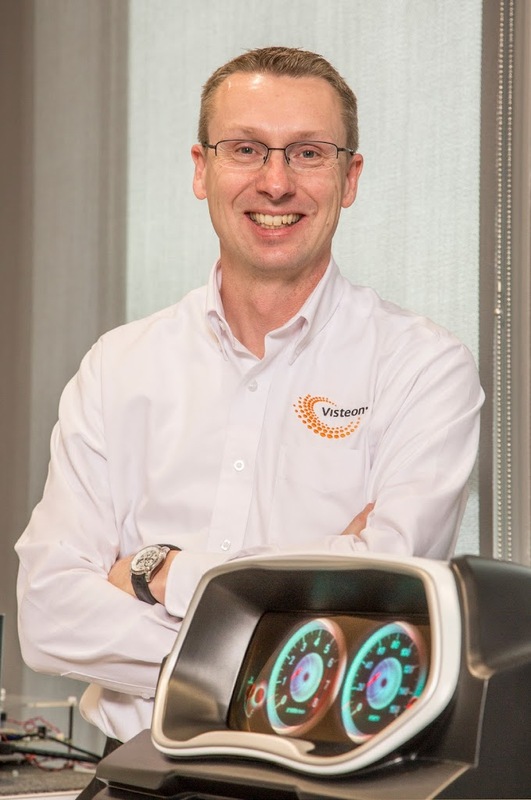 Stephan Preussler is responsible for advanced trends analysis at Visteon. He has held various positions in marketing, innovation and concept vehicle builds during his 15-year career in the automotive industry. Today’s cars and trucks are on a power trip – with an increasing need for more features and functions. Driver assistance systems … automated modes … convenience features … and connectivity to personal devices, the outside world and the cloud – all consume energy. Inside automobiles, this hunger for power takes the form of electronic control units (ECUs). Traditionally, every electronic function—such as infotainment, navigation, instrument displays or driver assist systems—has required a separate ECU with increasing processing power to direct its operation. Until recently, microprocessors weren’t capable of handling multiple functions. Now, with consumers demanding more electronic features in their rides, new cars have been devouring ECUs as rapidly as they can be installed. It’s not unusual for new vehicles to house 100 microprocessors – and that number is expected to reach 200 by 2020. Modern mobility vehicles are one of the most complex products on the globe, integrating up to 100 million lines of software code; that figure will likely double in the next 10 years. In view of this increasing complexity, it is imperative that progress take place intelligently. The industry must effectively manage the cognitive load, and work within the situational awareness limitations of the vehicle and its environment. So how does the auto industry address the power tripping issues noted above, and ensure development times keep pace with the consumer electronics industry? It’s a daunting task, but not insurmountable. Since consumer devices last two to three years and the mobility/vehicle lifecycle is currently 11-12 years, the industry is looking at over-the-air software updates and hardware upgrades to keep pace with the consumer electronics industry. These solutions also need to reuse software assets and create products that do not need to be redesigned in order to implement the latest consumer wants and needs. Visteon has developed technology that consolidates the functions of two, four, eight or more ECUs by taking advantage of the tremendous increase in computing power of today’s microprocessors. The SmartCore™ system uses Visteon-developed virtualization that allows a multicore SOC (system on chip) microprocessor to run many functions by splitting up the processor’s power for use by a variety of devices. At the nucleus of this virtualization technology is security, which is achieved by keeping the virtualization software code to a minimum and running multiple operating systems unmodified. This isolates safety-critical elements from non-critical elements and from the outside world. SmartCore also uses a component modeling software architecture that is written in modules, like LEGO® blocks. This allows the same basic code elements to be used for all levels of vehicle design, with additional blocks of code inserted for luxury vehicles. Previously, entirely separate and unique code—100 million+ lines— needed to be written for low-, mid- and high-end cars. This challenging path for mobility provides the inspiration to innovate new and creative solutions. Domain controller architecture solutions such as SmartCore will serve as a foundation for exciting vehicle experiences that enable drivers to be more productive and relaxed in connected and autonomous vehicles. is leader of emerging technologies at Visteon Corporation. Since joining Visteon in 2000, he has served in various roles, from engineering, program management and business development to his present position. 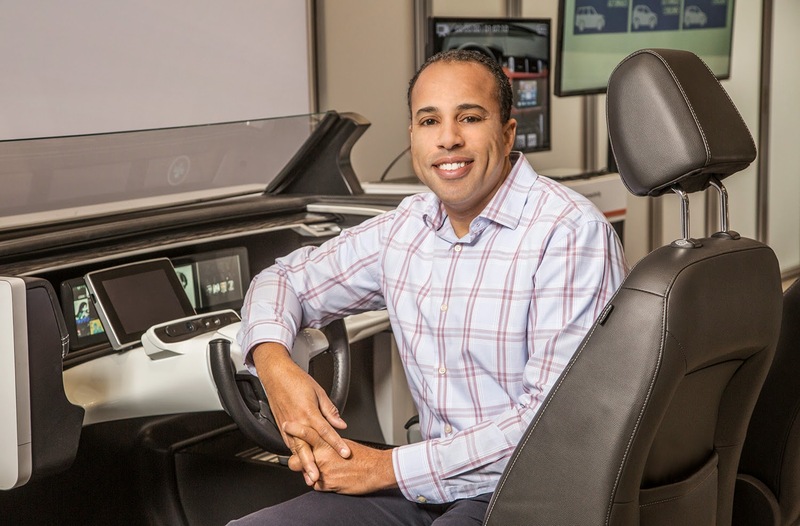 His responsibilities include identifying and developing the next generation of connected vehicles, fusion and mobility solutions. Key to these solutions is the seamless mobility experience that customers will expect in future vehicle environments. Manufacturers mail notices to tens of thousands of vehicle owners. Owners schedule an appointment with dealers. Owners drive the vehicles to the dealership, leaving them for new software to be installed. A technician physically connects a server to the vehicle’s onboard diagnostics port to download the update. The auto manufacturer receives a warranty bill from its dealers. For a few fixes, such as a navigation system map update, automakers have been able to provide USB drives containing software, but that’s typically only for infotainment systems, and owners have to install these software updates themselves. Vehicle updates are pushed from the vehicle manufacturer’s server and downloaded to appropriate vehicles. The vehicle owner selects a few on-screen buttons including “accepting the software update” and identifies a good time to perform the update. Original Equipment Manufacturers (OEMs) can do exactly that with LTE Multicast, a newly implemented feature of 4G wireless communications that uses Visteon’s Connected Vehicle Hub and Verizon LTE Multicast technology for automotive over-the-air software updates. LTE Multicast was initially intended to enable wireless carriers to broadcast video programming to millions of devices simultaneously over cellular networks. Visteon looked at LTE Multicast with a different eye. We realized that LTE Multicast is an ideal distribution mechanism for vehicle software updates – critical for making the connected car a success. Each car or truck is essentially a listening device and LTE Multicast allows automakers to deliver over-the-air software updates, bug fixes and feature enhancements to all connected vehicles or a selection of vehicles concurrently. The simultaneous nature of Multicast means that network utilization is not impacted and the data cost is equivalent to a single data file. Further, Multicast is uniquely suited for the automotive market since hardware activation is not a requirement to receive broadcast content. A typical telematics control unit (TCU) requires wireless account activation before it can be utilized; such activation occurs when the consumer takes ownership of a vehicle. Visteon invented the back end of this system—the Connected Vehicle Hub—which works in much the same way as iTunes for mobile phones. The Hub is a Web portal tool where an OEM representative manages the download for distribution. The OEM can decide when to send them and to which vehicles—by model year, trim level or even by VIN. Until now, there has been no way to do this with the telematics control modules or wireless gateway modules in most vehicles. Updates through TCUs had to be performed one car at a time, and each of those downloads was an independent transaction on the OEM’s wireless bill. Imagine sending a one-gigabyte update to 10,000 cars and being charged for every byte, 10,000 times! LTE Multicast sends that one-gigabyte of data to all the cars instantaneously, with a one-time charge by the carrier based on the actual broadcast file size. LTE Multicast updates often will be delivered over the air while vehicle owners sleep. They’ll install automatically or at a convenient time, indicated by the driver. LTE Multicast is equally useful before a new vehicle even is delivered to the buyer. As each car rolls off the assembly line, its telematics module will receive an electronic program guide, similar to the scheduled-recordings menu on your home DVR. The guide can tell the car: Every Thursday at 4 a.m. for the next three months, wake up and listen for a broadcast. If you hear it, accept the download. If it’s not there, go back to sleep. For vehicles on the assembly plant’s or dealer’s lot that must be updated to fix a newly discovered issue, this simple, simultaneous updating replaces the current practice of going to each car and manually installing the software—a huge undertaking with thousands of hours for a large “Yard Campaign”. LTE Multicast also can reduce complexity. Instead of manufacturing multiple versions of a vehicle, each with different infotainment or powertrain calibrations, assembly plants can build them with the same hardware and then simply broadcast different software to each model segment. The same goes for emissions software. Using GPS, LTE Multicast can pick out the vehicles that require software to meet California’s emissions regulations and separately find and download different software for the high-altitude conditions in Colorado. LTE Multicast can deliver substantial cost savings to manufacturers, increase brand loyalty for dealers and enable consumers to keep their vehicles current. It’s a prime example of finally bringing the best of digital communications to a process that until now has been stuck in the slow lane. 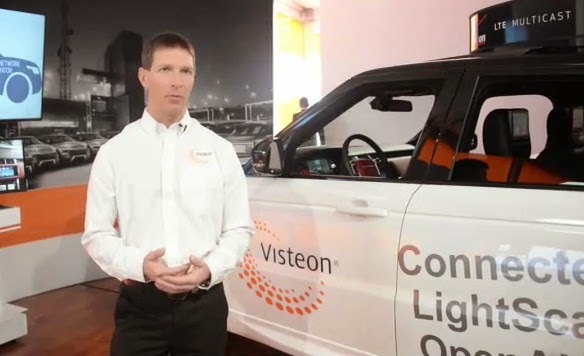 This video shows how Visteon adapted LTE Multicast to demonstrate the benefits of sending software updates to an entire set of vehicles simultaneously. Upton Bowden is an electronics marketing and portfolio planning manager at Visteon, responsible for identifying innovative concepts and developing compelling automotive applications. Now that most of us are comfortable with 4G LTE communications, which is no more than five years old, it’s time to start preparing for 5G – the fifth generation of wireless technology. It’s about to change our lives significantly, because it will allow us to interconnect nearly every electronic device we use, especially the technologies in our cars. The capabilities of 5G will be a particularly exciting focal point of the Mobile World Congress (MWC) in Barcelona during the first week of March. This new generation of powerful wireless systems is designed to facilitate the Internet of Things (IoT) by furnishing multiple connections to distribute data, instead of relying on just the one connection at a time. Innovations like connected cars will rely on 5G functionality, which is why we’ll be showcasing both Visteon’s traditional telematics interfaces and our vision for connectivity gateway solutions in Barcelona. Within that vision, we’re looking at innovations like Verizon’s LTE Multicast (applied in the automotive industry for the first time with the Visteon Connected Vehicle Hub), which lets mobile broadcasters send video, messages, software, firmware over-the-air (FOTA) updates, telematics content and other information to multiple vehicles or other receivers simultaneously. At MWC we’ll be eager to move beyond traditional telematics control units to demonstrate the Visteon Wireless Gateway, which is designed to manage and connect with multiple external wireless carriers such as cellular, Wi-Fi, global positioning systems (GPS) and dedicated short-range communications (DSRC). It does so while providing a high-integrity connection to the car and services to its occupants as the vehicle drives through an ever-changing external wireless environment. The Wireless Gateway is designed to function as an integral part of the map to the IoT and is crucial to supporting the multiple interfaces that 5G enables – including the distribution of data from vehicle-to-vehicle (V2V), vehicle-to-infrastructure (V2X) and within vehicles. One of the interesting connected car dilemmas emerging from multi-path data distribution involves basic account management for consumers. With the neighbor’s kids in the back seat sharing data with your spouse in the front, and with passing cars using bandwidth to communicate with your vehicle, how do we determine who pays for which data? We’re likely to see more industry alliances forming to lay out easier-to-manage billing plans. MWC participants will also be debating how more spectrums for wireless can best be obtained from the “digital pidend” provided by channels once dedicated to analogue television and the use of white space between TV and radio channels. Any way you look at it, the demand for data on the move is insatiable, and we’ll need to provide more room for it. 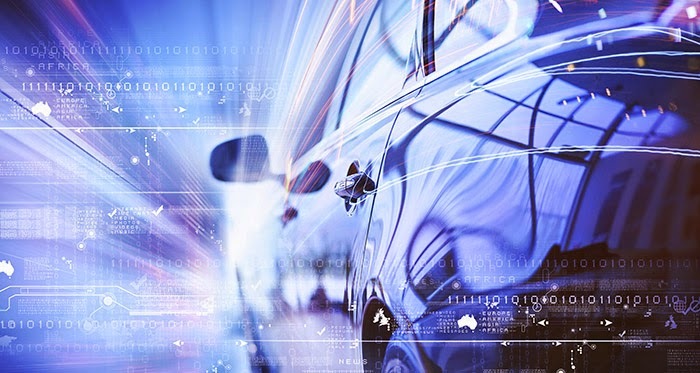 Automakers and Tier 1 suppliers will be challenged in the years ahead to collaborate ever more closely with the mobile network industry for solutions that are both backward and forward compatible. This will help ensure that next generation of connected vehicles will remain capable and current as the wireless environment evolves. During his 22- year career in the automotive industry, Martin Green has held a number of positions including roles in advanced systems engineering with a focus on hybrid and fuel economy technologies and marketing manager for Visteon electronics. In his current role as a technology planning manager, Martin is responsible for analyzing global technology trends and customer needs to identify and bring to market next-generation connectivity solutions. Not so long ago, the International CES® (Consumer Electronics Show) in Las Vegas was something that most attendees of Detroit’s North American International Auto Show (NAIAS) had only vaguely heard about. Both shows occur in January, but the auto show traditionally held the full attention of the automotive world at the start of the year. The shows attracted entirely different audiences and had different purposes. Today, that situation is entirely different. The one theme that most connected the two shows was connectivity itself. Wireless capability in cars was a big deal at CES, as it was at NAIAS, but for a different purpose. The ultimate connected device—the driverless car—made a huge splash at CES, where issues like safety, security, industry standards and information accuracy were also raised. At NAIAS, the overall experience of passengers in autonomous vehicles was a main topic of conversation, with an emphasis on ways to keep occupants engaged through entertainment as they travel. At Visteon, we have been focusing on bringing it all together. At CES, our large connectivity gallery had several vehicles, each equipped with connected services technologies. One example of our integration efforts is our work with Verizon’s LTE Multicast technology, which allows an automaker to send software updates to one small batch or to all cars in a fleet simultaneously. Not only does Multicast allow automakers to update cars without requiring a customer to visit a dealership, it also allows consumers to download the latest apps, interfaces or graphics, which can improve the ownership experience and help keep the vehicle relevant over time. While the consumer-electronics giants that traditionally have been prominent at CES are focused more than ever on integration with cars and trucks, the automotive world is picking up on a common technique from the high-tech computing arena: open source development. NAIAS was a launch pad for automakers to begin talking about making their patents openly available as a way to jointly advance the industry in ways that no single company could do on its own. In fact, a non-profit industry alliance, called GENIVI® (Visteon is a founding member) is driving the broad adoption of an in-vehicle information (IVI) open-source development platform. One further connection between these two worlds (which some jokingly call the convergence of “geeks” and “grease”) that I’m watching for is the translation of Big Data to the connected automotive world. The ability to accumulate data on how, when and where drivers use their cars provides unprecedented opportunities to improve the driving experience through vehicles that can recognize the preferences and habits of drivers. The potential ramifications of knowing every stop, destination, song selection and phone number input by vehicle occupants is staggering, allowing vehicles to become smart, integrated and personalized companions for drivers of the future. By next January, I anticipate that the differences between these two enormously influential shows will take a backseat to intricately connected plans by contenders from both the high-tech side and the automotive sector – even if the specifics of what they share at each show remain slightly different. That ever-stronger connection will continue to make January the start of something much bigger than simply a new year. Richard Vaughan is manager, design experience, and is responsible for leading the design team dedicated to turning consumer insights into next-generation, in-vehicle experiences. As the leader of Visteon’s global consumer-perceived quality program, he has traveled the globe interviewing consumers from different cultures to gain a full understanding of what drives consumer perceptions. Vaughan was educated at Detroit’s College for Creative Studies and is a lifelong car enthusiast. He has been a car judge at both the Concours of America at St. Johns and the Eyes on Design, is involved with several automobile clubs, and helped organize a car and bike show among Visteon employees. Safety is an important and therefore expected characteristic of automotive transportation. While traffic fatalities in the US have decreased significantly over the past several decades through the introduction of technologies like energy absorbing materials, ABS, airbags, and electronic stability control, we seem to have now reached a plateau. To point the fatality curve downward again, the industry is introducing the next generation of safety and warning products. Read the entire feature blog on the CEA Blog website.